Dubai Property – Dubai Real Estate investment information for you. Dubai’s International Media Production Zone (IMPZ) seeks to create a unique cluster environment for media production companies from across the industry value chain, and from across the world, to interact and collaborate effectively. Catering exclusively to companies in the Graphic Arts, Publishing and Packaging industry. IMPZ will provide an environment of growth by building key facilities, investing in infrastructure, and forming a unique free zone that incorporates industrial, commercial, and residential and community service projects under its mantle. The vast complex is currently being developed on 43 million square feet of land, in the heart of commercial Dubai. Investment and guides to buying property in Dubai. Invest in your future. Dubai Property Show are pleased to announce the launch of an exclusive new development within one of the hottest new areas of Dubai, The IMPZ (International Media Production Zone). Today, Dubai is an important tourist destination and port (Jebel Ali). It is developing as a hub for service industries such as IT and finance, with the new Dubai International Financial Centre (DIFC). The United Arab Emirates (UAE) will become the most popular emerging country for overseas property investment during 2008, according to a survey of investors carried out by Homebuyer and Property Investor Show (HPIS). The World Travel and Tourism Council (WTTC) expects tourist numbers to the Middle Eastern federation of states – which were initially created by Britain to alleviate fears of piracy in shipping lanes – to reach 14 million by 2015, which could make the area attractive to investors. Perhaps the most well know of the emirates is Dubai, which already has a developed property investment sector. According to HPIS, annual capital appreciation in the region is some 25 per cent – with further potential to invest likely to emerge in the future. 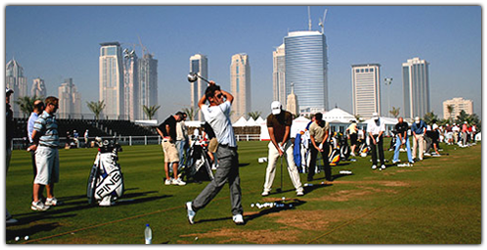 One of the key developments in the country is Dubailand, which is likely to form a major attraction for tourists. The complex will be made up of six zones including theme parks, an eco-tourism desert resort, a Tiger Woods golf course, and an indoor ski resort. When the project is fully completed in 2015, the development will be twice the size of Disneyland. "Dubai is the financial, business and tourism capital of the region, and has attracted investors from across the globe due to its potential for significant rental yields and the price appreciation of freehold properties," said Saeed Al Qatami, managing director of developers Deyaar. Other UAE opportunities exist outside of Dubai. For example, Ajman, the smallest emirate, which was once a small fishing village, is also developing fast. An international airport is scheduled for completion in Ajman in 2011, with prices expected to increase by between 15 and 20 per cent annually over the next five years. "Ajman benefits from similar tax incentives as Dubai, but the cost of properties is much less. This in turn has attracted a huge number of investors, both local and international," said Mark Woods, business development manager of Key4International. The average 805 sq ft property in the county costs around £45,000 – half that of a similar home in Dubai. "The new airport will certainly be attractive to tourists and business travellers. However, until that is completed, the emirate can be easily accessed from Dubai International Airport," continued Mr Woods. "There is also a local market; many local workers in Dubai cannot afford to rent there. So Ajman offers an alternative in terms of cost and location". Copyright © 2008 DubaiProperty4u. All rights reserved.